Kershaw is owned by the KAI Group which also includes the Zero Tolerance and Shun Cutlery brands. Like many other knife manufacturers their primary production facilities are based in Oregon, USA due to the state’s relatively relaxed knife laws. Kershaw produces a broad range of knives ranging from sporting, professional, pocket and kitchen knives. Since their formation in the mid-seventies they have grown into one of the most respected and popular knife brands among collectors and enthusiasts with a passion for innovation and high quality. In recent times Kershaw have forged a strong partnership with renowned custom knife maker Ken Onion who invented the award winning SpeedSafe opening mechanism now found on many popular Kershaw knives. This mechanism allows for an accelerated blade deployment yet is not considered an automatic-opener that many states have banned. 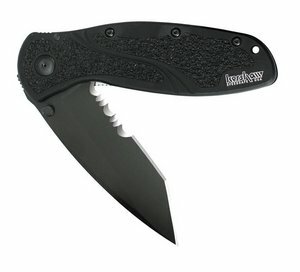 Kershaw manufactures a comprehensive array of pocket knives for every situation, from every-day-carry (EDC) knives that can tackle cardboard boxes with ease to sporting knives designed for fishing, hunting and other outdoor pursuits to tactical knives geared towards self defense and combat situations. Kershaw knives generally provide excellent quality at an affordable price. Many of their knives are made right here in the USA but others are made abroad, most commonly in Asia. That said, while some may disagree I believe that a knife manufactured overseas does not necessarily mean quality is sacrificed and Kershaw is a great example of that. Some of the more popular Kershaw pocket knife lines include Cryo, Leek and Shallot all designed for everyday use. In the tactical and professional category their Blur and CQC lines are good choices. If you’re looking for something more military or law enforcement style then check out their sister brand Zero Tolerance. The Ken Onion Tactical Blur is a good quality yet reasonably priced folding knife made in the USA. This knife comes with a 3 3/8 inch partially serrated blade made from Sandvik 14C28N stainless steel. It has a black anodized aluminum handle fitted with Trac-Tec material which provides a non-slip grip. The Blur features Kershaw’s Speed-Safe assisted opening which allows for a swift and smooth blade deployment using a single hand. The blade arrives tremendously sharp out of the box and has a tanto style meaning the blade carries a chisel-like point that is thick near the point and therefore very strong. Overall a highly effective pocket knife that can be had without breaking the bank. So much has been written and said about the Kershaw Leek that it almost speaks for itself by now. Quite simply one of Kershaw’s finest designs (again from Ken Onion) and hits the sweet spot between size and functionality. Again we see the Sandvik 14C28N, perhaps our favorite budget steel and the Speedsafe action which is oh so slick. Super light and stylish, the Leek is the everyday gentleman’s knife that does the job without much fuss. <a href=”https://knifeinformer.com/kershaw-knives/”><img align=”center” src=”https://knifeinformer.com/wp-content/uploads/2015/03/EDC-Infographic-Kershaw-v1.1.jpg”></a></br>Kershaw Knives Infographic by <a href=”https://knifeinformer.com”>KnifeInformer.com</a>.